We grew up here and saw the evolution of Budapest's nightlife day after day, and decided to share this experience with you. New bars and pubs are still popping up every now and then, but we are kind of old-fashioned (but not old! ), and want to show you how it all startedâ€¦ Party all night crash the day after..
We offer 40 minutes of Unlimited Premium Drinks with people who have the same idea about nightlife as you :) And did I tell you we are the only pub crawl in Budapest offering long drinks in their all you can drink package. Why limit yourself to shots and beer, when you can have a rum with some coke, or gin & tonic? For some of us, it's a power hour every night :) If you want an epic pub crawl choose the power hour! This is an extra package, but happens at the same time with the same super group of people! Let's meet at Oktogon, 9PM! Would you like us to organise your Pub Crawl for you? Do you want to be with your close friends? Try our Private Pub Crawls! Let us know what you need, where we should pick you up, and we will do our best to make a perfect night for you! 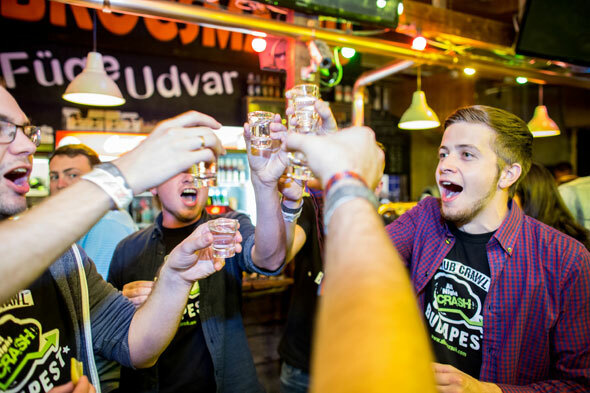 You want to celebrate your last free days in Budapest? This is the best choice that you can have! Budapest has everything that you need to make your stay unforgettable. We have a lot to offer to Stag / Hen groups! Check out our Stag Pub Crawl page, and contact us for our specialised offer! Bored of lager beers everyday? Our Craft Beer Pub Crawl is definitely for you! In Hungary just as well everywhere in the world, craft beer breweries are popping up at every corner. From pale ales to stouts, beer enthusiasts will adore our beer crawl. Budapest is ready, come and taste our beers! Would you like to taste Hungarian Wines? This private tour is excellent for small and even for bigger groups! We taste wines from Hungary's best wine producing regions while our guide tells you the history of all! We also drink FrÃ¶ccs together (the way Hungarians survive the summers) as well as the famous naturally sweet wines from Tokaj (at least one at the end to get the feel). Still interested? Check out our Wine Bar Tour in Budapest page, which will tell you the details! Do you have some doubts, you can't decide? We compiled the most common questions that you asked us over the last decade! Do you have ruin pub crawl every night? What is this pub crawl about exactly? Well, we'll take you to 4 pubs in the downtown party area of the city. The pubs are within walking distance, and we selected them carefully so that you get the best of everything that Budapest has to offer! Among others, we'll show you the famous, unique ruin bars and introduce you to the crazy local nightlife! At the end of the tour we'll get to a local dance club (Usually Instant / Fogas). When you'd think it can't get any better, the real party begins! You may stay as long as you wish and party as much as you can. Does it sound like a challenge...? As you meet the partying locals, you won't be able to resist it! How many guides will be provided? We usually provide 1 guide / 20 people. How can I recognise the guide? He or she will be in red T-shirt / Jacket / Top depending on the weather, and you can read Pub Crawl on the back. Is it cheaper to buy tickets online? Absolutely! Check out our online prices! They are always cheaper! Do you organise private tours? Yes, of course! Please contact us on phone, mail, or chat to get a special offer. Is it allowed to smoke in the streets in Hungary? Yes, it is, although at the bus or tram stops it is forbidden. Is it allowed to smoke in the clubs, bars in Hungary? No, it is forbidden, although in open-air it is possible to smoke. Can I party till the morning with you guys? Definitely! Our last stop is the best and biggest club in Budapest, which is open till 6AM! How long is the pub crawl? It starts from 9PM, and we reach the last club around 1:30. You can stay there till the morning. What should I do if I am lost during the pub crawl? What does pub crawl mean? A pub crawl (sometimes called a bar tour, bar crawl or bar-hopping) is the act of drinking in multiple pubs or bars in a single night, usually travelling by foot or public transport to each destination and occasionally by cycle. Many European cities have public pub crawls that act as social gatherings for the local expatriate communities and tourists. These crawls focus on the social aspect of meeting new friends and being introduced to new bars in a foreign city. More on Wikipedia. Where does the word 'pub' come from? A pub, or public house, is an establishment licensed to sell alcoholic drinks, which traditionally include beer, ale and cider. It is a relaxed, social drinking establishment and a prominent part of British, Irish, Breton, New Zealand, Canadian, South African and Australian cultures. In many places, especially in villages, a pub is the focal point of the community. In his 17th century diary, Samuel Pepys described the pub as "the heart of England". Ruin bars are something we only have in Budapest, they are a speciality of the city. There are a bunch of ruined but really neat Monarchy era buildings that instead of being renovated are made into high-quality pubs and bars but keeping their run-down atmosphere. They are usually furnished with vintage communist era stuff and are hit with that absurd hipster aesthetic. You can find them all over the 7th (the party district). Our pub crawl goes to these bars, so you can't miss them. What are the favourite drinks of Hungarians? Hungarians have a unique shot, called Palinka. It is very popular at local people, but beer and wine are also favourites. The other typical Hungarian drink is Unicum, a dark spirit made of herbs, a bit sweeter, but pretty similar to Jaegermeister. Unicum is a Hungarian herbal liqueur or bitter, drunk as a digestive or aperitif. How much is a pint of beer in Budapest? Around 1 - 1,5 euro, 325 - 500 Ft.
Can you drink in public in Budapest? Which is the biggest and most popular ruin bar in Budapest? Do you go to Instant / Fogas? Yes. Usually, we finish there, and you can stay to party till 6AM. Is there public transport at night in Budapest? Absolutely! The main tram: 4-6 is a non-stop tram, and we have night time buses. The numbering starts with 9, e.g. 908. Underground is closed at night. The Hungarian currency is the Forint, or you can see it write like this: HUF, or Ft. 325 Ft is around 1 Euro. No! Hungary is relatively cheap. One pint of beer is around 1-1,5 Euro. A meal in a good restaurant is around 10-15 Euro. A Big Mac meal is around 5-6 Euro. In Budapest, under 40 almost everyone can speak English or at least understand. This is not true in the countryside. Where can I find out more about Budapest? Check out our questions and answers about Budapest, let us know if you want to know more!